Bloggys 2015: I've got nominated! Few months ago, i decided to take blogging seriously and publish relate-able and useful posts for my readers. This is due to some blogs and personalities that i follow online who created a real impact for me as a blogger and as a Christian. I also decided to take blogging into more tangible things----to join blogging events some time. Last week, i received and email that i've got invited as a guest of honor for bloggy's 2015. I feel so overwhelmed about this. Prior to that, i also got people sending me messages in twitter and google plus about my blog. I also got featured in paper.li. For me, those happenings in my blog is truly worth the effort in taking time to pull up serious posts. "To put it simply, #bloggys2015 is a nationwide blog awarding event in the Philippines. 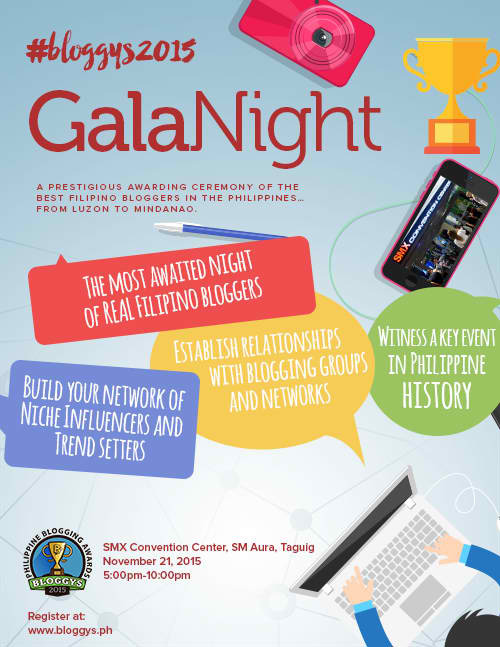 It continues the legacy of recognizing Filipino bloggers through a variety of niches and industries across the nation. I would like to invite everyone to take part in making history. Whether you’re a seasoned blogger, student, call center agent, teacher, government employee, street sweeper, journalist, TV reporter, traffic enforcer – you’re welcome to nominate your own or someone else’s blog. This is going to be one big hunt for the best bloggers in town! =)"
You can nominate your blog until September 30, 2015. If you pass the screening, your blog can be voted until October 31st. Finally, on the gala night, you will be awarded. To know more about the details of Bloggys 2015, click this. You can also be a part the event, by simply reserving your ticket and become a guest of honor. You can also click this to see, who's attending already. So i'm inviting all my Filipino blogging friends in this event, and let's all meet & party there! THIS IS RED CARPET GUYS! haha. this is really an interesting blogger event... Good luck and I wish you all the best steve...but of course.. I hope you will have a blast! Cheeers! Ok lang hindi manalo blue. Why dont you jpin bloggys too? Nice! I hope you grab an award. We would be very happy that you succeed, And i really hope that this event will continue to cultivate and enrich and even popularize the art and culture of blogging. Let's keep writing! By the way, it is an honor to be included in your list. I am flattered! Hehehe! Thank you mr trispters! hahahahahaha, i am also happy to read your writings! See you around! I am so happy for you friend. I really hope you win.Thanks for the nomination friend. Thanks friend! :) Nomination is already a blessing! Thanks Michelle, see you 'round! Well deserved sir! All the best and wishing you luck! apir!